When protesters broke into Government House on Friday, demanding his resignation, Thai Prime Minister Thaksin Shinawatra may have wondered at how quickly public opinion can change. Less than a year ago, Mr Thaksin was re-elected with a huge majority, feted as the man who could alleviate poverty while simultaneously improving the country's finances with his "Thaksinomic" agenda. But since then he has faced a barrage of criticism over matters as diverse as corruption and misuse of power, free trade, and an ongoing Islamic insurgency in the country's south. "The honeymoon period is obviously over," said Giles Ungpakorn, a political analyst at Bangkok's Chulalongkorn University. "The real problems in society are emerging, and there are many groups who are now coming out to oppose the prime minister." Mr Thaksin's supporters say there is no cause for alarm. They point out that with no major election on the horizon, Mr Thaksin's rural popularity is still strong. Government spokesman Surapong Suebwonglee said the prime minister was unfazed by the recent protests. "It is normal for any leader in any country for their popularity to go up and down," he said. One of the chief thorns in Mr Thaksin's side is a business tycoon named Sondhi Limthongkul. In the past few months, Mr Sondhi - an erstwhile friend of Mr Thaksin - has been on a single-handed mission to discredit the prime minister. By fighting for freedom of the press and political reform, he has struck a chord with many middle-class, urban Thais. Mr Sondhi has used various allegations of corruption to further his cause - including accusations of bribery in the purchase of equipment for Bangkok's new Suvarnabhumi airport, and conflicts of interest involving business interests owned by Mr Thaksin's family. When his current affairs show Thailand Weekly was taken off air last summer, Mr Sondhi launched a series of mobile talk shows in Bangkok's Lumpini Park, attracting huge crowds eager to hear his latest allegations of government mismanagement and abuse of power. It was his latest show on Friday which led to the break-in at Government House, with Mr Sondhi leading his supporters there to demand Mr Thaksin's resignation. But according to Giles Ungpakorn, although Mr Sondhi has been effective at galvanising opposition to Mr Thaksin, he is not a great threat to the prime minister. 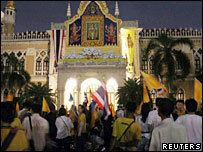 "At the moment, there is no serious challenge to Thaksin on a national basis," Mr Ungpakorn said. Part of the reason for this is that the various groups who have voiced grievances against the prime minister do not have a unified agenda. 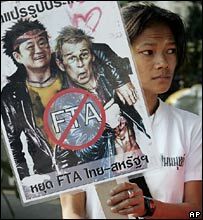 Only some of the thousands who have protested against Mr Thaksin in recent weeks are supporters of Mr Sondhi. Some are farmers or teachers, angry at changes in legislation, while others oppose the prime minister's stance on free trade. In fact, the most unifying factor among them may be anger at perceived government corruption, and even this is an issue which only galvanises a few people into action. Pasuk Pongpaijitr, the co-author of a book called Thaksin: the Business of Politics in Thailand, said that while corruption did concern some sectors of Thai society, it was important not to overestimate its importance. "What we hear in the newspapers often represents a minority view. For many people, especially in the countryside, it's not that important." "But it could alter people's views more if it was coupled with an economic downturn," she added. Another issue on which Mr Thaksin has often been criticised, especially in the international press, is his handling of the ongoing Islamic insurgency in the south. More than 1,000 people have been killed in the past two years in the continuing violence, and human rights groups accuse the authorities of exacerbating the situation with their heavy-handed approach. But while the situation is obviously affecting Mr Thaksin's standing in the south - his Thai Rak Thai party currently has no MPs in the three worst-affected provinces - it is yet to become an issue which affects the way people living in other parts of the country cast their ballots. In fact, according to Pasuk Pongpaijitr, the prime minister is actually gaining from the situation by taking advantage of people's sense of insecurity. "He may have made things worse, but he's capitalising on it, in same way George Bush has been doing with Iraq," she said. All that could change, Giles Ungpakorn warned, if the violence worsened. "If the situation escalates or there are bombs in other places, like Bangkok, or if more police and army are killed, it could seriously affect Thaksin's popularity," he said. With all this criticism against him, Mr Thaksin has retreated to safer ground this week, concentrating on a topic which even the opposition finds hard to criticise - his policy of poverty alleviation. He is spending five days in the north-eastern province of Roi Et, holding workshops to discuss his proposals and even living in a tent in the garden of a local villager. "This is a good way of deflecting attention from other issues which the newspapers are pressing him on at the moment," said Pasuk Pongpaijitr. Government spokesman Surapong Suebwonglee said the main aim of the trip was to educate officials about the prime minister's plans. But once again, the critics are refusing to let up. The Thai media has almost universally labelled his trip a publicity stunt, due to the astonishing 96 hours of TV coverage planned, in a special programme called Backstage show: The prime minister. Even his trip up to Roi Et was disrupted by protesters. Hundreds of teachers staged a rally in the area on Monday morning, and Mr Sondhi has taken his talk show to the province. 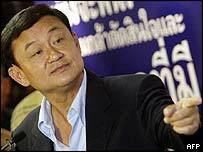 It seems that even by sleeping in a tent in one of the most isolated parts of Thailand, Mr Thaksin cannot escape his critics.